FBN’s Ashley Webster breaks down the details of Halliburton’s acquisition of Baker Hughes. 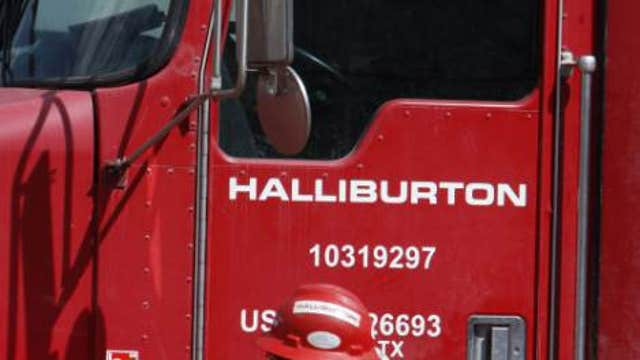 Halliburton (NYSE:HAL) scored a $34.6 billion deal to buy Baker Hughes (NYSE:BHI), as the oilfield services companies look to defend against cheaper oil, and industry leader Schlumberger (NYSE:SLB). Halliburton, the second-largest oilfield services firm, will pay $78.62 a share in cash and stock. The offer reflects an enterprise value of $38 billion and a 31% premium over Baker Hughes’ share price on Friday. The cash part of the deal will be funded using cash on hand and debt, Halliburton said. The Houston-based companies expect to complete the transaction in the second half of 2015. Baker Hughes shareholders will own roughly 36% of the combined company, which will be led by Halliburton Chairman and Chief Executive David Lesar. Shares of Baker Hughes rallied 12.7% to $67.50 in recent trading Monday, while Halliburton slipped 7% to $51.23. Oilfield services companies, which offer equipment, data management and other assistance, have been under pressure in recent years amid a shift in North America to shale oil. Producers have turned to hydraulic fracturing and horizontal drilling to extract oil from shale plays, a pricier endeavor compared to conventional wells. Analysts say Halliburton was partly motivated to acquire Baker Hughes to reduce those costs and capitalize on its smaller rival’s exposure to North American shale oil. According to the Energy Information Administration, U.S. oil production in August posted volumes not seen since July 1986. The deal also comes as global oil prices hover near their lowest levels in four years, driven by concerns over a glut in supplies. Drillers could counter ongoing weakness in oil prices by scaling back production. Such a move would put greater pressure on companies like Halliburton. Halliburton’s proposed combination with Baker Hughes would create an oilfield services provider that can better compete with Schlumberger, which has a market value of $123.8 billion. The transaction ranks as the sixth-largest deal ever in the oil and gas sector, according to Dealogic. It would surpass the 2006 takeover of Burlington Resources by ConocoPhillips (NYSE:COP) and ExxonMobil’s (NYSE:XOM) 2010 acquisition of XTO Energy. But it’s not a done deal just yet. The combination of the second- and third-largest oilfield specialists will likely face scrutiny from government regulators. In order to assuage those concerns, Halliburton said it’s prepared to sell businesses that generate up to $7.5 billion in annual revenue if required by regulators. The company expects that any required divestitures will be significantly less. Halliburton will pay Baker Hughes a termination fee of $3.5 billion if the deal doesn’t receive antitrust approvals, but Halliburtion said it’s confident regulators will green light the transaction. Halliburton forecasts $2 billion in synergies from the deal, which is expected to add to earnings by the end of the second year after closing. The companies had 2013 pro forma revenue of $51.8 billion. They employ more than 136,000 employees and operate in more than 80 countries. The agreement ends more than a month of talks between Halliburton and Baker Hughes. News of a potential deal first surfaced last week. Shortly after, Halliburton made a hostile attempt to secure a takeover by nominating a full slate of nominees for Baker Hughes’ board. Halliburton said it’s withdrawing those nominees and expects the combined company’s board to have 15 members, including three from Baker Hughes. “We envision a combined company capable of achieving opportunities that neither company would have realized as well--or as quickly--on its own,” Baker Hughes Chairman and Chief Executive Martin Craighead said in a statement.